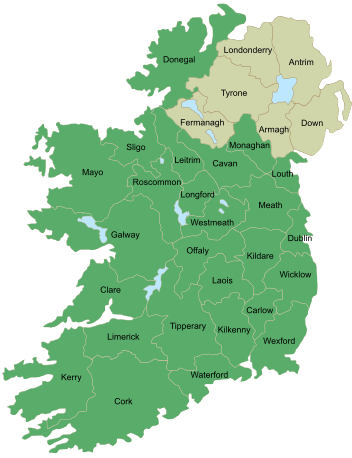 The Worked EI Counties (“WEIC”) Award, shown above, is for working (or hearing) stations located in different counties of Ireland. The original rules and conditions for the WEIC Award were drawn up and proposed by Michael McNamara EI2CL in 1982-83, to commemorate the 50th anniversary of the founding of the IRTS in 1932. In December 2006, the requirement for QSL cards was replaced by a requirement for a certified log extract. 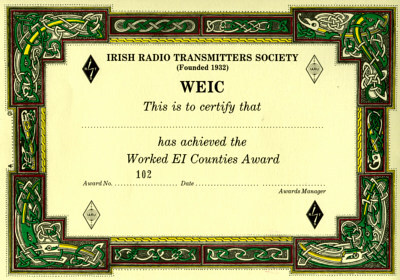 The WEIC award, issued by the Irish Radio Transmitters Society, is available to licensed amateurs worldwide who have worked stations located in different counties of Ireland (EI/EJ). It is available to SWLs on a “heard” basis. A claim for the WEIC Award must be accompanied by a certified log extract (see below), to include date, time, frequency, mode, station worked and its county. Contacts made only on or after January 1st 1982 are valid. There will be a charge of €5.00, Stg £5.00 or US$10.00 for the award. Band endorsements will be available at the time of first application. A separate “All 26” sticker will be available for confirmation with all 26 counties. All contacts must be made from the home station. Contacts made via repeaters or while operating mobile, portable or from an alternative address are not reckonable. Work/hear 20 of the 26 EI/EJ Counties. A log extract, certified as a correct extract from the claimant’s log by an officer of a Radio Club or by two licensed radio amateurs / experimenters, should be submitted to the Awards Manager.